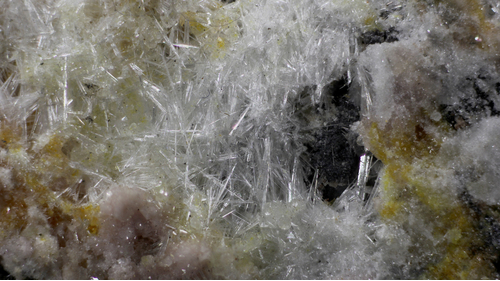 Bright transparent larsenite crystals on white to pink clinohedrite and yellow zincite. Chet Lemanski Collection. Photo by Vandall King. 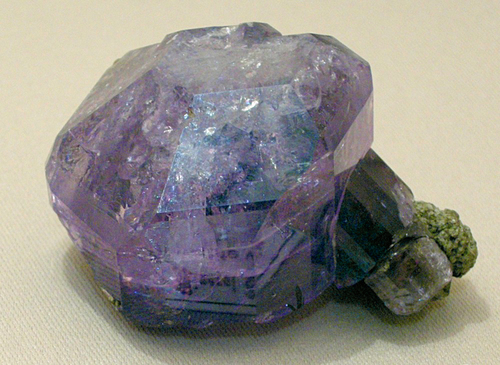 Roebling apatite-(CaF) 3 x 3.8 x 4.3 cm. Smithsonian Institute specimen. Tiny dark orange multiple growth wulfenite crystal with olive-green pyromorphite in a tiny quartz vug in clinochlore-rich rock. 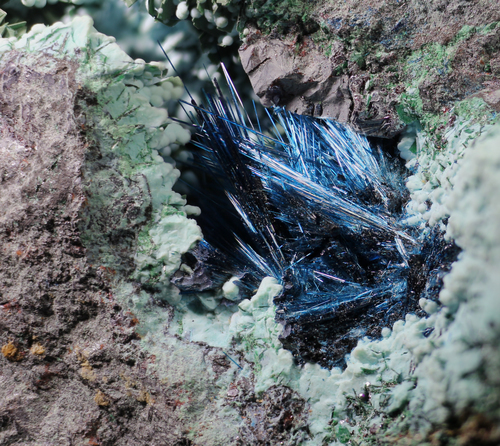 Enormous cluster of deep blue connellite crystals in matrix. In Bob Jenkins' collection. 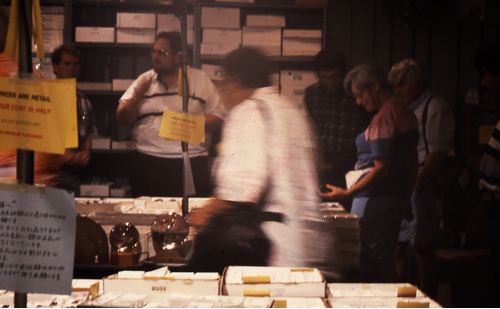 Rock Currier (center) talking to customer (left side of photo) on the right of the photo is L>R Alfredo Petrov, Elsa Horvath, and Lazlo Horvath. February 1995 at the sales room near the lobby of the Executive Inn. 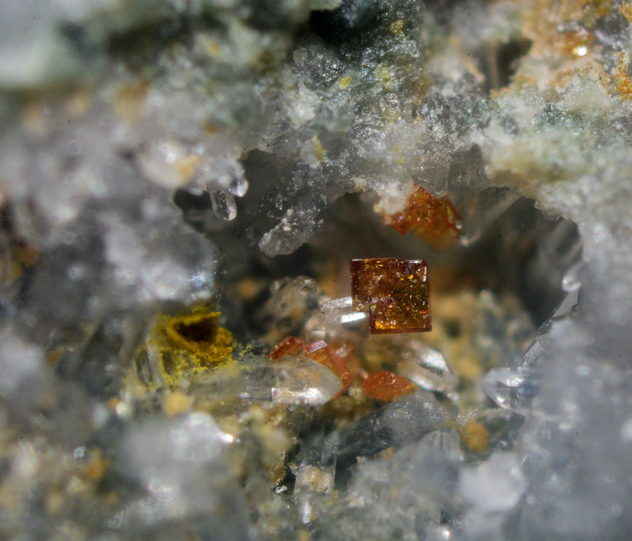 Dark brown doubly terminated zircon crystal with green amphibole, white calcite, and golden brown goethite stain. Photo by Van King. 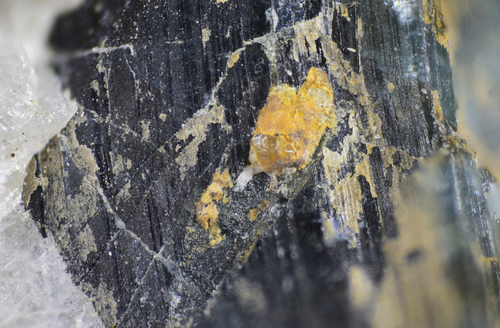 Cloudy gray-yellow partial microlite crystal with adjacent yellow stain on dark-green nearly black tourmaline. 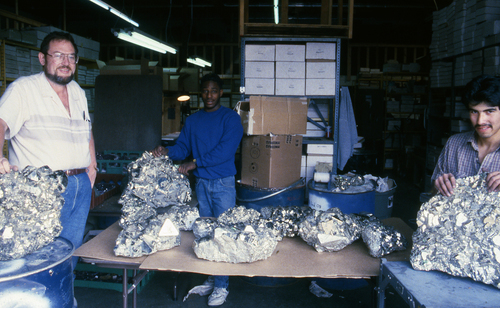 Quite likely this was the kind of specimen that prompted Charles Upham Shepard to designate the mineral "microlite." 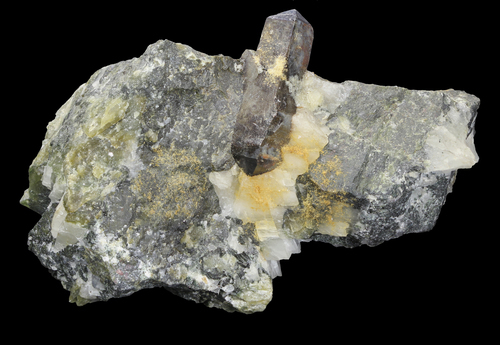 Quartz and cleavelandite matrix with associated watermelon tourmaline. 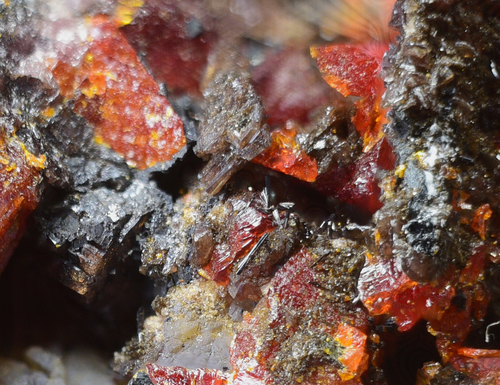 Black needles of Mineral E in a vug just above upper center with red and yellow zincite, drusy brown vesuvianite, pink leucophoenicite, black pyrochroite crystals in a matrix consisting of pink leucophoenicite, black franklinite, and red and yellow zincite. 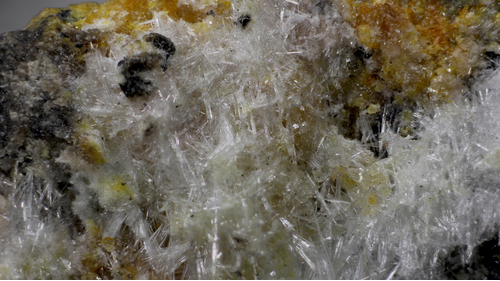 The Mineral E crystals are very reflective and are in radial clusters of up to about 5 rod-like crystals. Modris Baum collection.